I continued besides the Rhein on the south side, so basically on the Swiss side. One night, I met an elderly couple who cycle along the Rhein from where they leave the camper. They advised me to cycle on the German side of the Rhein. So I did the next day and it was a good decision. The North side as people call it has good bicycle paths and leads along less busy roads. Adding to that it is more flat then the Swiss side, which I appreciated with all my weight. I continued my journey until Rheinfelden and from there I returned back home. I have never been to Schaffhausen before, so I’m very happy to have seen such a pretty town. Not long after Schauffhausen we got to the Rheinfalls. When you stand there, watch and feel the water flow past, you really feel the force of the water. For me that was an amazing experience. From there on the Rhein curves its way through beautiful forests and farm land. On the way I was able to see king fishers and squirrels amongst other interesting creature. We continued along the lake and its meadow where the Bodensee slowly leads into the Rhein. The stunning village Stein am Rhein lies right at the beginning of the Rhein. The medieval houses with beautifully painted facades are an eye-catcher. 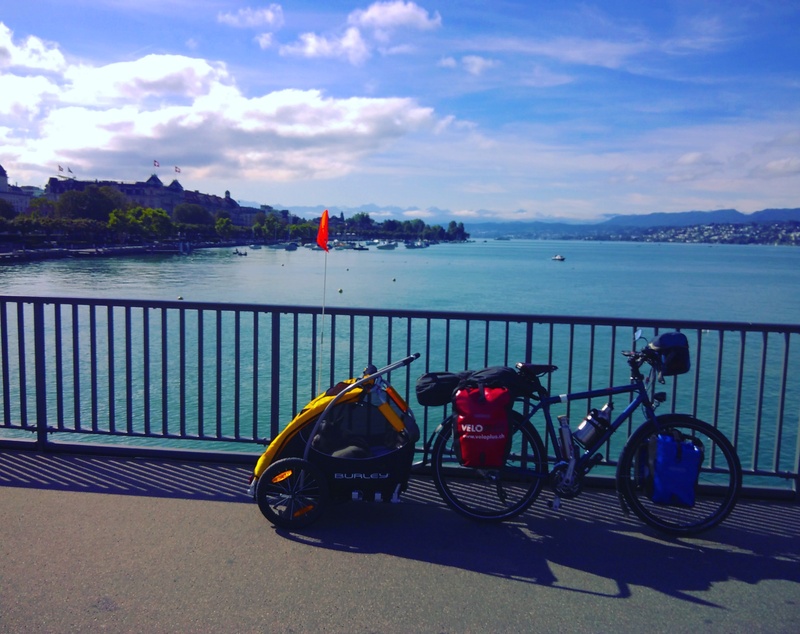 Cycling nearby the Rhein until Schaffhausen is very nice. With plenty of nice spots to rest, and enjoy the view. When cycling on the north of the Rhine at times I felt rather confused about which side of the Switzerland Germany border I was on, as it does not consistently follow the river. Having had an amazing time in Milano, it was time to think about where to go next. I reconsidered everything and came to the conclusion to better go back home. Despite my mother’s birthday which I spontaneously decided to go to there was the whole point with my dog. She already got a decent age and I want her to enjoy this journey too. With no options for her to go swim during our travels and no other way to cool off at 35 degrees I took the decision. Adding to that there were nearly no bike paths and the roads are in no good shape. Of course I felt a bit disappointed at this stage. Thus, I decided to make my own “Tour de Suisse”. To read on where I will go and what I experience follow my blog. And if you already do, thank you for your support! The next day I set off to Milan through beautiful scenery in the Lombardy. I had about 45 km ahead of me and in the morning the sun was already strong. There were basically no cycling routes, so we had to drive on roads. We drove through small towns but cars sometimes seemed to pass by very fast. Adding to all of that Zora was not enjoying the wagon very much as the roads are in rather bad shape. We made a lot of breaks in the shade, and there lured a lot of mosquitos. I booked In advance a hostel in Milano, which Zora and I looked forward to relax. Milano is a very beautiful city with my favorite part being the “Bosco verticale”. These are two skyscrapers which have trees growing on every level. When I arrived in Lugano it was already arranged that my friends neighbour came to get me at the train station. We loaded the bike into the car, and shortly after a storm was over Lugano. We drove up the hill to Astano where I was taken in by my friend Aranda. I ended up hiking and relaxing there for a few days. Thank you to all of you for your help and kindness! I continued my journey down the hill to Ponte Tresa where Zora and I embarked the boat to Brusino. From there I biked across the border of Italy in direction Como. With a few days delay, due to administration work I left Zürich in direction Lucerne. But also because I forgot how long it takes to pack. I left later then planned. Its clear to bring as little as possible, but how much of something to take with? Do I really need that? Do I want a bit of luxury and take a foldable camping chair? How many herbs do I want to take with. So its not too much but that I can have a nice meal on the go. Zora and I arrived well in Lucerne and where very well hosted by my friend Katja. From Lucerne I started with having to go quiet a bit up hill through the “Meggerwald”. What I didn’t expect was the seemingly never stopping rain. I arrived in “Küssnacht an der Rigi” soaked through. Being so wet I felt demoralised and started thinking on where I could go. A campsite would have been another two hours ride and the only other option was an expensive hotel. The weather forecast for the coming days also looked rather bad. So I decided to take the train to Lugano. This USB charger is integrated into the handle of my bike as an “addon”. It gets the electricity from the dynamo. This is a good idea though really not worth the money. First my Fairphone doesn’t charge when plugging it in directly, which apparently is a thing with some phones. We then used a power bank which also adds weight to our already heavy load. Secondly it only charges properly when riding a certain speed. We were heavy loaded and thus didn’t always manage to have the needed speed. It was just not sufficient we ended up having to charge our phones in cafes and camping places when we needed it. Hopefully a future module is more efficient in producing electricity.